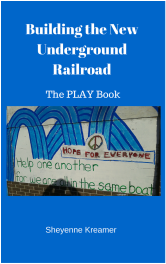 "Building the New Underground Railroad: The PLAY Book"
From corporate professionals with advanced degrees to people who have experienced homelessness (and who, by the way, sometimes ALSO have advanced degrees!) - some of the key reasons for long-term unemployment are part of everyone's story. The causes have their roots in some of our longest-standing systems and belief structures. From my perspective, these systems are killing our society, and our economy. The powers that be have convinced us that there are no easy solutions for reducing unemployment. I don't happen to believe that's true. Peace and prosperity should be available to everyone. We were designed that way. The solutions are relatively simple. They could be done with the money we are already spending now. It's time to "Build a New Underground Railroad". Are you ready to PLAY? Here's what one reader had to say! People get ready! There’s a train a’ comin’! Sheyenne Kreamer blows the lid off of what’s holding people, and this country, back. Her story of how anyone can create a successful entrepreneurial path is truly remarkable and uplifting. Sheyenne’s passion and mission were evident from the first time I met her. If you want to finally break free and claim your mission, purpose, and a solid income – read this book and hop aboard the train! ~ Dori Staehle, Chief Encouragement Officer and owner of Rock the Next Stage and best-selling author of Find Your Divine Rhythm: A Creative’s Success Formula. Now Accepting bitcoin for the EBook version ONLY! Claim Your Thank-You Gift for Purchasing "Building the New Underground Railroad"! If you enjoyed the book (or e-book) and would like more information on how to get started with "Living Your Song", join our email newsletter below and you will receive our new e-workbook - "Living Your Song"! A $27 value - our gift to you - our valued reader!